August Stripers and Cape Cod Bay is Lighting Up with them! 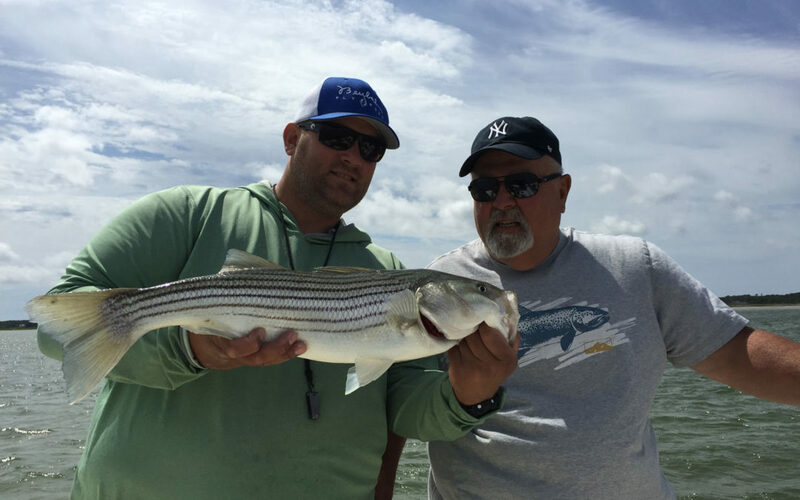 Cape Cod Bay is “lighting up” with August Stripers! I looked up and saw a herd of boats just off of the “east bar”, or in oth­er words, in my fish­ing zone. As quick­ly as pos­si­ble I gath­ered my guests onto the boat and off we went to inves­ti­gate. Things didn’t look nor­mal. There were no div­ing birds or break­ing fish. The boats were all very close togeth­er mov­ing slow­ly. There were fish­ing rods in hand, but there was no cast­ing. Clos­er inspec­tion revealed lines over the side in the man­ner of fish­ing with bait or jigs. Final­ly I noticed that all eyes were focused on the elec­tron­ics, specif­i­cal­ly the sonar/fish find­ers. Come on out and see the August Stripers. They are here and look­ing for­ward to mak­ing your acquain­tance.